Imagine a perfect Duluth summer evening in late July 1907. You and a friend, dressed in your best summer whites and straw hats, arrive via the Hunter’s Park Limited streetcar and alight at McGhie’s grocery store at Oxford Street. You discover, to your aesthetic delight, an avenue of torches guiding you to Hunter’s Field, just half a block away. You stroll with dozens of others through a brilliantly lit arched entrance—electric lights!—to a forest glen around the edges of which a creek gently gurgles, a tableau of softly colored paper lanterns enhancing the light of a full moon and the occasional flash of lightning bugs. The scents of pine trees, wildflower and sticks of incense waft through the air, and next to a decorated stage, beautiful young women pose on pedestals like classical statues. A full orchestra plays while small children and young girls dressed as fairies flit about. The play you are there to see? Naturally, Shakespeare’s “A Midsummer Night’s Dream,” directed by local Professor A. F. M. Custance. All the actors are neighborhood young people with names you recognize: Hugo, Washburn, Denfeld, Macfarlane, Nolte, Woodbridge, Hunter and Miller. They are the sort of young people you read about in the local society pages, who attend the finest colleges and East Coast preparatory schools. They are the children and grandchildren of Duluth’s leaders: mayors, school district superintendents and real estate men. Even young Claude Washburn, home from his travels, is there to play Lysander. 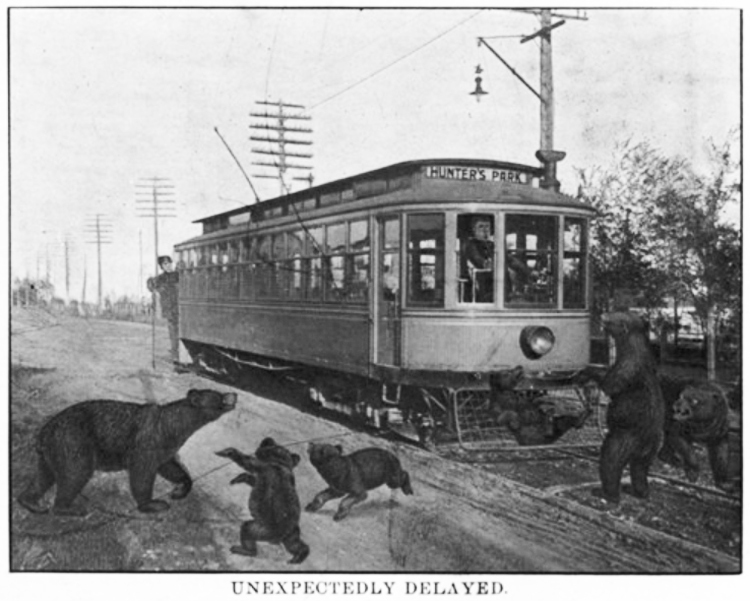 Hunters Park residents must have been chagrined, however, to see their neighborhood misidentified in the review’s headline: “Woodland Made a Fairy Haunt.” Even in 1907, as today, Hunters Park as a distinct neighborhood could be “disappeared” by a tendency to call everything along the Woodland Avenue streetcar line past Mount Royal “Woodland.” (For a history of Woodland, click here.) Neighborhood residents knew that Hunters Park’s boundary on that side of the avenue ends midway up Dairy Hill, or what is today the entrance to Hartley Nature Center, and it’s likely that the Duluth News Tribune received more than one critical note in the next day’s post to that effect. Hunters Park today has absorbed three other smaller neighborhoods: Waverly Park, Kenilworth Park and Glen Avon. Of these three, only Glen Avon is still used in common parlance. The original Waverly Park has been split in two, half of which is now included in the Chester Park-UMD neighborhood. The Kenilworth Park name never stuck, but on plats it was the area between Woodland and Livingston Avenues, Snively Boulevard and Oxford Street. Except for the insistence of real estate agents, older residents, and cranky historians, the survival of the Hunters Park name is still under threat of being absorbed by Woodland. The southern boundary is Arrowhead Road; the eastern boundary is Vermilion Road (with a bit of an easterly jog to Silcox and Wallace Avenues); the northern boundary is Tischer Creek where it runs west to east through Hartley Nature Center; from Hartley Road, the western boundary zigzags north along the Hartley property. Each of the neighborhoods was centered on a community institution. For Waverly Park, it was the first Duluth Curling Club, which was located within the rectangle formed by Vermilion Road, Wallace Avenue, Bruce Street and Victoria Street (now Arrowhead Road). Kenilworth Park’s offering was a fire hall on Vermilion Road. Glen Avon was centered on the Glen Avon Presbyterian Church, originally located across the street from the current stone edifice. And Hunters Park’s heart was McGhie’s grocery store at Oxford Street, also known as the Hunters Park Grocery and, later, the Snow White. It could be said that Hunters Park, more than any other Duluth neighborhood, was the personal fiefdom of one extended Scottish family, spearheaded by Ronald M. Hunter and his brother-in-law Angus Macfarlane. While Ashtabula Heights and the East End were full of gorgeous mansions built for the richest of Duluth’s citizens, Hunters Park and Glen Avon, platted in 1891, were meant to be exclusive in an altogether different way. Oatmeal Hill is one name that continues to confuse some, but Jean Macrae asserts that it refers specifically to the area by Waverly Avenue from Hardy Street to Victoria Street (now Arrowhead Road). According to information she received from Jean Gibson (who grew up at 1907 Waverly), the name was coined by Dan Mahoney and his brother George Gibson. It seems old Mother Gibson was fond of making big bowls of oatmeal for the boys before they ran down the hill to catch the streetcar on their way to work at the bank, and thus the appellation stuck. When Macfarlane and Hunter platted the neighborhood to sell their real estate, they named the streets after places they knew in Scotland and England, Sir Walter Scott literary references, elite colleges, famous Scotsmen, and the women they loved. While there were never any written covenants restricting ownership in the neighborhood, it was widely rumored that Macfarlane and Hunter flat-out gifted the first lots to friends they wanted as neighbors, which would explain why so many of the earliest residents were Scots as well. At a time when neighborhoods opened up for sale with a huge advertising blitz, Hunters Park was notable for the lack of such fanfare in its earliest years. A 1907 article a little more than a month after the Shakespeare evening bore the subhead: “Only the Right Kind of People Are Wanted by the Dwellers in This Beautiful Suburb.” Residents were quick to assert (somewhat disingenuously) that “Wealth is not a necessary qualification—far from it. What is desired by the Hunters parkers is respectability and neighborliness.” Lots were purportedly “cheap,” but it was clear that aside from one small group of servant-class Italians who lived on Carlisle Avenue, “respectability” included a very narrow subset of Duluthians, Scots Presbyterian preferred. Indeed, unlike most Duluth neighborhoods, there was only one church: Glen Avon Presbyterian. Originally a Gothic style structure built in 1893 for families who found traveling downtown to First Presbyterian too onerous, the present church was finished in 1909. It is made of bluestone quarried from nearby Hunter’s Hill, then described as “blue trap stone with trimmings of brown stone and…plate glass windows and chandeliers of the latest kind.” The vast majority of community events were centered on the church, including a popular annual Fourth of July picnic held at Hunter’s Field, complete with fireworks.